Located on a Beachfront property. Not on the main road but in quiet cul-de-sac away from road noise The apartment is fully self catering. The accommodation is located in a resort like garden setting with an easy walking path where just one minute's walk across a grassed area and a few easy steps takes you to the sandy beach with safe swiming . There are no tide rips or sudden drop offs, just nice level sloping sand. 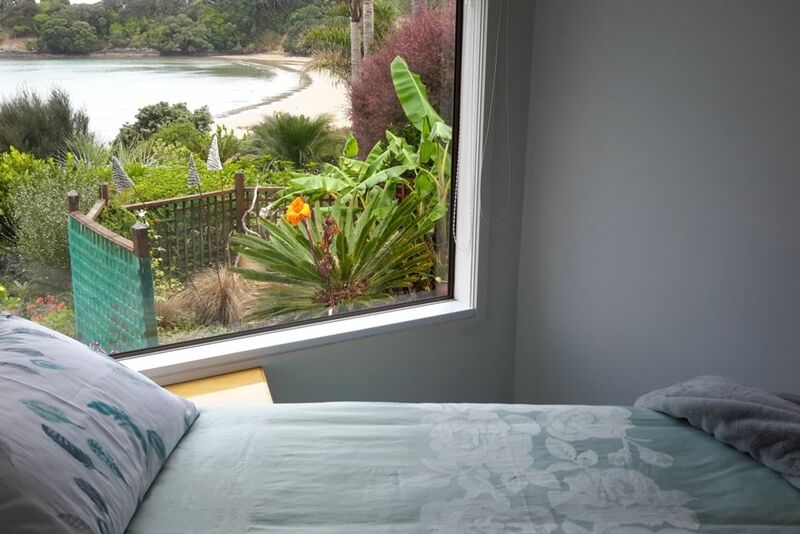 Located near historic Mangonui villiage with it's stores, cafes, famous fish shop and restruants. fishing charters Super clean and tidy for discerning travellers. Best place in the world for your holiday. Toilet access ffrom bathroom with privacy door. Location, location, location - unbeatable. What could beat having your own beach access at the bottom of your garden? Answer access to a number of beautiful swimming and walking beaches. A comfortable, well appointed and extremely clean bach. The hosts Cliff and Jennifer were very welcoming and had lots of recommendations regarding locations of interest, bush walks and beaches. What a perfect peice of paradise. We truly enjoyed our stay in Coopers Beach “SAILS “ Jennifer and Cliff made us very welcome . We stayed 5 nights. The place was perfect from the clean , comfortable apartment,great garden and views. And a big plus was direct access to the beach . We would love to return. Thanks Jennifef and Cliff. Wow, this is a very special place - with the most superb, congenial hosts. The accommodation was immaculate and so close to the sea that you could hear the waves on the beach - absolute magic. The garden is beautifully laid out and expertly maintained. We could not fault this property - in terms of location, cleanliness, or friendliness of hosts. All the conveniences had been thought of - lots of additional thought had gone into provision of extras. We could have happily stayed on! Highly recommend. Thank you for sharing your experience with us. It was a pleasure to meet you and we hope to see you again in the near future. We had a wonderful stay at Sails. The setting is beautiful, with easy access to the beach, and the apartment was well equipped - perfect for our family of 4. The Knights are great hosts. We highly recommend Sails. Smart little place full of rustic charm. Everything you need is here. Small, cosy and very relaxing. Ideally for 2 people, but another 2 is ok for a small stay (if you know them well). A series of bays and beaches to visit and use great safe swimming .Historic Mangonui Harbour Village with shops and restruants. The area is central for all Far North exploration on a day trip basis.